If you're an older adult who hasn't researched the answer to the question, "What is osteoporosis?" then you should. Your bone health could be at risk. Osteoporosis can result in "pain, fractures, loss of mobility and independence, and diminished quality of life," according to Douglas P. Kiel, MD, MPH, ASBMR, president and director of the Musculoskeletal Research Center and senior scientist for the Institute for Aging Research at Hebrew Senior Life. It’s a question that should concern all women: “What is osteoporosis?” Yet it also should concern men, who may not be aware they also could be at risk for the disease. You may not realize that your bones—like all your body tissues—are metabolically active, and that they change as you grow, mature, and age. This change is enabled by a constant building up and breaking down of bone—a process called remodeling. In remodeling, cells called osteoclasts break down, or resorb, old bone, and cells called osteoblasts form new bone. Up to about age 50, this system is balanced so that the ratio of new bone to old is maintained. As we get older—and particularly in women, after they go through the menopause—more bone is resorbed than is manufactured. It’s this imbalance that underpins osteoporosis. In fact, in addressing the question “What is osteoporosis?” it’s important to note that the disease involves, literally, “porous bones” that put you at risk for osteoporotic fractures. And if you’ve already had one osteoporotic fracture, your risk for subsequent fractures increases threefold, according to research presented at the World Congress on Osteoporosis, Osteoarthritis, and Musculoskeletal Diseases in April 2016. Understanding your own risk factors for osteoporosis will give you a better idea of how to protect yourself—or it may ease some of your worry. 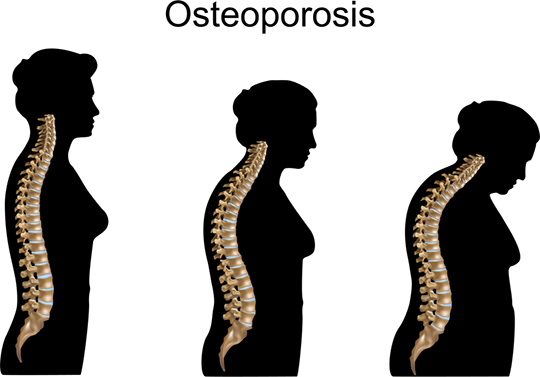 You’re more likely to develop osteoporosis if you have a family history of the disease, are excessively thin, went through menopause before age 45, smoke, or drink alcohol to excess. Certain medications (such as corticosteroids, used to treat rheumatoid arthritis, and diuretics, given to treat high blood pressure) also raise the risk. Women who have received chemotherapy for breast cancer are at increased risk. Medical conditions such as celiac disease and Crohn’s disease may boost risk by interfering with calcium absorption. Men should know their bone density scores start getting assessed annually for osteoporosis risk factors from age 50, according to the American College of Physicians. Things that make men vulnerable include female relatives with osteoporosis or parents who suffered a hip fracture, along with using steroids or prostate cancer drugs, gastrointestinal diseases, and excessive alcohol consumption. The Endocrine Society recommends that all men start routine screening and receive a DEXA Scan for osteoporosis at age 70. DEXA scan results will tell you what your bone density is and if you are at risk of osteoporosis. A bone density T score roughly reflect how much bone you’ve lost—for example, osteoporosis -2.5 equates to 25 percent bone density loss, and osteoporosis -3 equates to 30 percent bone density loss. Get enough calcium. The recommended daily amount for women age 50 and older is 1,200 milligrams (mg), while men should consume 1,000 mg daily up to age 70, and 1,200 mg daily after age 71. Aim to get as much of your calcium as possible via dietary sources (e.g., milk and dairy products, fortified cereals and juices, leafy green vegetables, and canned fish). Quit smoking. Cigarette-smoking is known to raise the risk for osteoporosis. Osteoporosis Guidelines – Low Salt Diet or Not? aging, alcohol, alcohol consumption, arthritis, balanced diet, blood pressure, bone, bone density, bone density loss, bone density scan, bone density scores, bone density t score, breast cancer, build bone, calcium, cancer, cancer drugs, celiac, celiac disease, chemotherapy, chemotherapy for breast cancer, corticosteroids, dairy, dexa scan, dexa scan results, diet, exercise, food, for osteoporosis, gastrointestinal, gastrointestinal diseases, health, healthy balanced diet, healthy diet, high blood pressure, hip fracture, loss of mobility, low salt diet, medical conditions, milk, mobility, moderate alcohol intake, natural remedies, natural remedies for, natural remedies for osteoporosis, osteoarthritis, osteoporosis, osteoporosis -2.5, osteoporosis 3, osteoporosis foundation, osteoporosis guidelines, osteoporosis is, osteoporosis osteoporosis, osteoporosis risk, osteoporosis risk factors, pain, Prostate, prostate cancer, prostate cancer drugs, quit smoking, rheumatoid, rheumatoid arthritis, risk factors for osteoporosis, risk for osteoporosis, senior life, smoking, strong bones, supplement, supplements, t score, the menopause, treat high blood pressure, treatment for osteoporosis, vegetables, vitamin, vitamin d, what causes osteoporosis, what is osteoporosis, your bones.